A living trust refers to any type of trust you create during your lifetime rather than having it take effect upon your death. Transferring the title of a home to a living trust will only protect it from a lawsuit judgment if the terms of the trust are irrevocable. However, most state trust laws allow attachment of the home by judgment creditors if the transfer is fraudulent. State trust laws recognize the trust as irrevocable if the grantor, who is the person creating the trust, permanently relinquishes all ownership interests and control over the home and other assets in the trust. Moreover, grantors of irrevocable living trusts have no authority to amend or cancel the trust document after the date of creation. In contrast, a revocable living trust allows the grantor to retain control over the trust assets, control distributions to beneficiaries or even the authority to cancel the trust. For purposes of protecting the home from lawsuit judgment creditors, you cannot retain any authority over the trust; otherwise, state laws will continue to treat you as the owner of the home, which then allows a judgment creditor to attach it. The permanence of an irrevocable living trust makes it one of the more extreme asset protection strategies. An alternative option is to create an irrevocable qualified personal residence trust, or QPRT, which allows you to retain a tenancy interest in the home. With a QPRT, you still transfer title to your home, but you retain the right to reside in the home for the period you specify in the trust document. 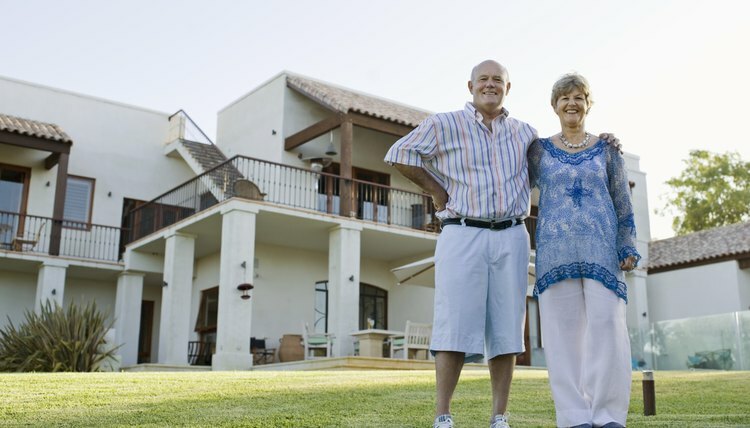 Your right to occupy the home is an interest that has value, but a QPRT remains an effective strategy for protecting the full ownership rights of the home from judgment creditors. Since the living trust you create will identify beneficiaries who will eventually receive the benefits of ownership in the home, it’s important consider the potential for their own judgment creditors to attach the home in the future. You can eliminate this possibility by including a spendthrift clause in the trust document that prohibits the trustee from transferring title in the home to anyone but the beneficiaries. Therefore, you can allow beneficiaries full use of the home, but as long as the trust remains the legal owner, lawsuit judgment creditors of the beneficiaries have no claim against the home. One significant limitation to using an irrevocable living trust to protect your home from a lawsuit creditor exists if you transfer the title to the trust after the creditor obtains a legal judgment. An irrevocable living trust only protects the assets you transfer to the trust against future creditors. However, your existing creditors can still attach the trust assets by claiming your transfer was fraudulent, meaning you do it for the sole purpose of avoiding attachment by an existing creditor. Moreover, some states, such as New York, will treat your conveyance of the home’s title to the trust as fraudulent if at the time you transfer the home you are insolvent, or transferring the home results in your insolvency.